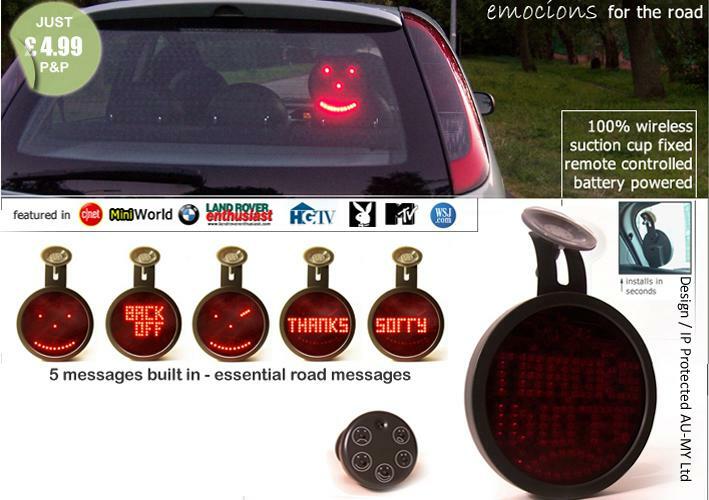 A Cool Car Gadget, this special car led sign has messages and emocions (“smileys”) which drivers can use to communicate with other drivers, Ensure you watch the video to further understand the product fully. 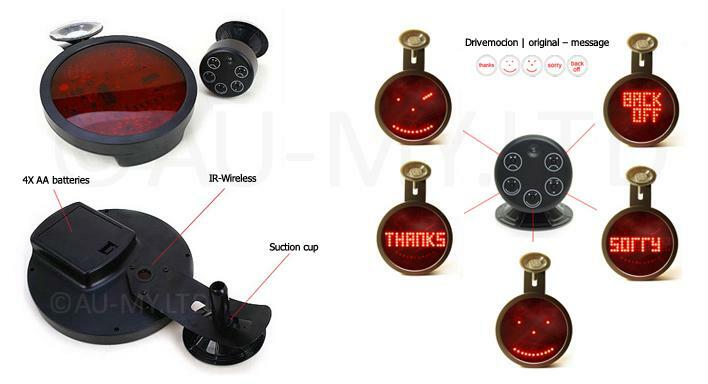 Click here to TELL A FRIEND about Drivemocion The Must Have Gadget Gift for Car enthusiast . If you buy more than one unit (with your friends), you'll get a free gift & discount. It simply fixes to the inside of the rear car window using a power suction cup. It’s remote control for the front of the car fixes to the front windscreen (using power suction cup) or optionally can be stowed in a front compartment (it’s fixing bracket can be removed). With the remote control fixed to the front windscreen, pressing it’s buttons to activate messages is very simple to operate. The main unit is powered by 4 AA batteries – there is no long wire to the cigarette lighter. Batteries last for approximately 4 month’s depending on usage. Please read the “Delivery” section from the “about us” drop down menu.